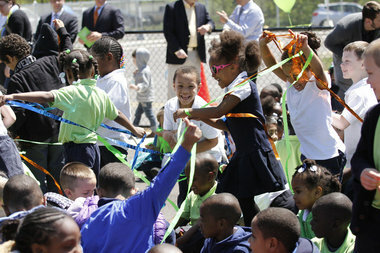 GRAND RAPIDS, MI – River City Scholars fifth graders shrieked and giggled as they released butterflies on Monday, May 13 to celebrate the official dedication of the school and the adjacent Oakdale Gardens Park. Between students, staff and community members, about 500 people were in attendance for the dedication of the school at 944 Evergreen St. SE, including state Sen. Dave Hildenbrand, R-Lowell Township, and founder of National Heritage Academies J.C. Huizenga. River City Scholars Principal Amena Moiz led the ceremony, The school opened in September 2012. “Just as we are planting seeds in young minds that will grow into a lifetime of successful learning inside River City, outside, the Oakdale Gardens Park provides a real-life text book about the wonders of the outdoors,” she said. Tom Bulten of Oakdale Neighbors and Steve Faber from Friends of Grand Rapids Parks led the dedication of the park. Colorful ribbons blew in the wind from the school fence reading words like “Fun” and “Friends”, students’ wishes for the future of the park.